Welcome to installment 4 of the deck design and building series of articles. It fills you in on laying out the post hole locations. It also addresses setting your ledger board. These are the same methods employed by professional deck contractors. I highly recommend Angie's List. - Ratings, reviews and sometimes revenge. See what local homeowners say about the service companies they hire. Always be sure to check your local building code. This series of articles begins with basic design issues and moves through to final finishing and refinishing. The links to the entire series are located at the bottom of the page as they are posted. Building your backyard deck is guaranteed to boost your property value and repurpose unused real estate for some kick-back entertaining and leisure time. You can choose to hire a deck contractor or tackle this great DIY project on your own and save money. This explanation assumes youre building a rectangular, attached (to the home) deck with cantilevered joists. It also assumes the plan is for the joists to start at one corner of your home. But if you are building a deck on top of an existing concrete patio, the layout process explained here is still applicable. Deck Terminology: A cantilevered deck simply means that your outside joists are secured to the ends of your ledger board as usual, however the ends of your beams are overhanging the post line giving it a less block-like look. Think Frank Lloyd Wright design. The numbers I use here are to make it obvious how you can use the 3-4-5 method to arrive at a square foundation layout (in this scenario, 6-8-10 are used; however, you can use any similar multiple. Make a pencil mark on your house where an end of your deck is to be located. Now, measure down your wall the distance that your beam will hang over. Hammer a nail in half way here. Next, measure 6 down your wall. Hammer in another nail. Tie your string line to the initial nail. Peel off a length of masons string thats longer than your finished deck will end up extending. Pull it taut and tie it off to a 2 X 2 stake. Make a mark on the string with a Sharpie 8 from the nail. Tie another string to the second nail and mark it with a Sharpie 10 out. Keeping strings taut, one person should hold the first string, someone else holds the other. Move the strings until the marks intersect. Hammer in the stake. This spot is directly perpendicular to the house. Repeat the above process for the other end. A square area is now defined with respect to the home. You will have already determined the number of your posts and the distance between them from reading the previous lumber sizing and spacing article. Now you'll use that knowledge to locate where your supporting posts will go. For each row of posts parallel to your house, use your Sharpie to mark the two staked strings. Using more stakes and strings, guided by the marks you just made to establish the rows, make a matrix. Now use the sharpie to mark the lines where the posts will be. Using your plumb bob, mark the hole locations on the ground with carpenters chalk or fluorescent spray paint. The lumber dimensions of your joists and the relative distance of your homes back door from the ground level are used together to determine the location of your ledger board. If it happens that your door is very close to the ground, your ledger board is actually two pieces of lumber, with one on the left side of your door and another on the right. If this happens, you can design your deck to be stepped up onto it. 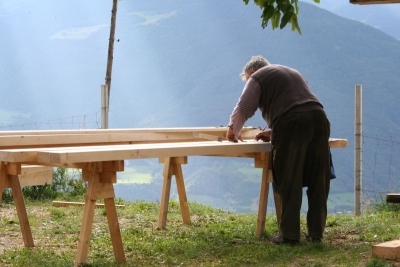 Be certain to make the ledger board level using a laser level or a water level. The next article covers setting and leveling the deck posts in fast setting concrete mix.